Is big data the reason that runs per game are at decades-long lows in baseball? And why your marketing strategy is failing? Like Brad Pitt’s character in Moneyball, programmatic media professionals create rich data sets to drive decision-making. Marketers use these data sets to ensure they reach the right people at the right time and the right price. Sounds like marketing nirvana, right? However, this laser focus on data comes at a cost. With marketers’ newfound focus on mastering data-driven insights to drive results, creativity no longer drives the message. Because senior executives are addicted to the numbers and have become dependent on analytics, marketers rely on data to tell them what works and have stopped thinking about why consumers engage. This approach fails to understand what truly motivates customers and diminishes the brand’s identity. Clicks, time spent, and conversion rates only describe what people do, not why they do it. If marketers rely on data to tell them what works, creativity no longer drives the message. Instead, an obsession with data leads to metrics tunnel vision, and as brands shift from their creative offensive, they neglect to consider consumer engagement. This neglect has serious consequences. An Adobe study revealed that companies are more likely to see revenue growth of 10 percent more than their peers if they foster creativity. Also, when marketers base strategic decisions on satisfying particular metrics, they may fail to take the overall company into account. This leads to thinking like, “I crushed my metrics goal this quarter. Who cares about any negative outcomes of my campaign?” or, “I can’t help another team take their project to the next level. If it doesn’t directly support my goal metrics, it isn’t an efficient use of my time.” Thought processes like these degrade marketers’ accountability and sense of teamwork. A brand’s offensive strategy should take a big-picture perspective and begin with a strong creative idea, such as the famed Oreo Super Bowl ad or the Dollar Shave Club videos. Sometimes, relying on a strong creative idea means taking a leap of faith. Analyzing data can make marketers less likely to take these risks. 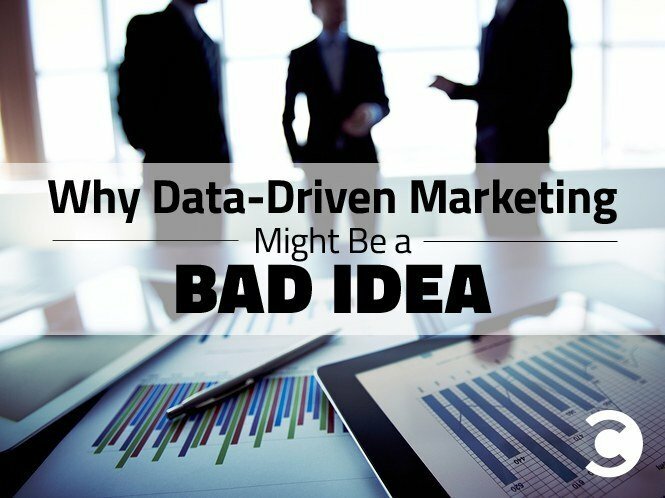 After all, some of the greatest marketing concepts didn’t have data to validate them before execution, which can be terrifying for data-addicted marketers. For example, after failing to make a profit for 10 years, Avis Car Rental hired Doyle Dane Bernbach to create a new ad campaign. Avis wasn’t thrilled with the resulting “We Try Harder” campaign but trusted DDB. The reward was worth the risk, and in a year, the company was out of the red. Had Avis insisted on having data to support the decision, it likely wouldn’t have taken the risk for an out-of-the box campaign that went in a new direction. After all, you can’t predict how every campaign will turn out; trying to do so will discourage risk in favor of sticking with the familiar. Focusing on creative doesn’t mean ignoring data. In fact, data plays an important role in directing creative. Incorporating both data and creativity means maintaining a balance between insight-driven ideas and compelling execution. Smart marketers bring their creative team and data geeks together . Writers and designers need to understand programmatic so they can tailor aesthetics and messaging to specific audiences. And programmatic analysts need to understand creative so they can communicate insights from the data. These insights allow brands to execute informed creative. Kellogg’s marketing is a great example of programmatic buying gone right. With each media buy, the powerhouse brand seeks to measure and understand its audience. It pairs KPIs, consumer insights, and channel data with creative strategy—a killer combination that has led to more then 70 percent viewability rates and targeting improved by two to three times. More than half of a campaign’s sales impact relies on creative. A company can have the best data in the world, but its campaigns will fail without good new ideas. After all, optimization will never win a marketing award. When you use data to supplement strategy—not substitute it—brilliant creative and programmatic buying will power digital success.